If your only requirement of an HTPC is that it be as small as possible, then it might be time to take a look at the Antec ISK 110 VESA case. The ISK 110 VESA takes the Mini-ITX platform about as small as it can go and still remain a complete enclosure. There is room for a Mini-ITX motherboard and a couple of 2.5″ hard drives, and heaven help you if your CPU cooler is taller than the motherboard backplate once mounted. The result is a case that not only has a small footprint, but as the name implies, can be mounted to the back of a TV or monitor using the supplied VESA mounting brackets. Selecting components for a case this small does mean paying close attention to the thermal characteristics of the components. There is little to no room for active cooling and heat issues can quickly become exacerbated if mounted behind a TV that generates a fair amount of heat. This case is about as small as it gets, and includes the necessary hardware to actually mount it to the back of a monitor. Antec has trimmed about as much fat as you could conceivably hope to trim; there’s enough room for a Mini-ITX board, two 2.5″ drives, and that’s it. 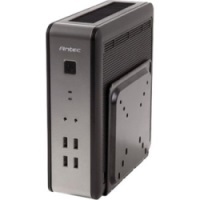 It includes an external 90-watt power supply and just enough internal power circuitry to drive low-to-moderate power hardware.